Last weekend’s “This American Life” told the story of the execution of 38 Dakota Indians in the frontier town of Mankato, MN. This event took place 150 years ago this month (December 26, 1862), and was the largest mass execution in American history. Dakota Sioux and settlers skirmished during the fall of 1862, after newly limited hunting grounds, confinement to poor agricultural lands, and delays in promised government assistance left tribesmen and their families hungry. The tribe tried to drive white settlers out of the frontier by force, and their attacks against frontier families, settlements, stagecoach stops, and forts whipped settlers into a panic. After the federal government, which had been distracted by the events of the Civil War, finally intervened, the Sioux surrendered. The lithograph below was printed on the 20th anniversary of the execution, in 1883; newspaperman John C. Wise, who founded several papers in Mankato, claimed the copyright. It’s unclear how this image would have been distributed, but it seems fair to assume that Wise would have sold copies for wall display in Mankato. The subject of the scene is less the execution itself and more the orderliness of the troops and citizen onlookers ranged around the execution platform. Before the execution, the governor of Minnesota had to beg his people to forswear vigilante justice against the prisoners; the arrangement of the scene served as proof that this entreaty worked. Several witnesses mentioned that the Sioux held hands as they were executed. If you zoom into the lithograph, you can see that this detail didn’t make it into the visual record; the figures stand, arms stiffly held at their sides. Thanks to Lauren Hewes of the American Antiquarian Society. 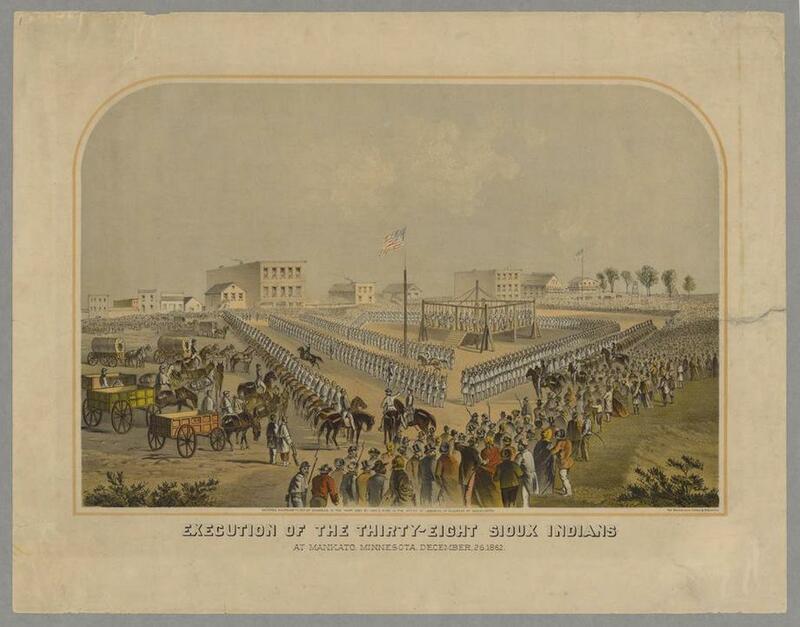 “Execution of the thirty-eight Sioux Indians at Mankato, Minnesota, December, 26, 1862.” Milwaukee: The Milwaukee Litho & Engr. Co., 1883. Entered according to act of Congress, in the year 1883 by John C. Wise in the office of the librarian of Congress at Washington. American Antiquarian Society copy the gift of Jay Last, 1997.